Welcome back to another weekly fashion post, where I share real fashion for real women. 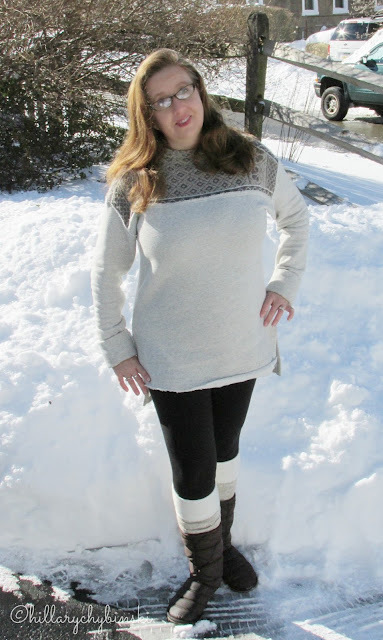 Each week, I highlight at least one outfit that I'm wearing right now, as well as provide ideas and inspiration to help you get dressed in the mornings. This past weekend we had a blizzard. We've only had one snow prior to this one, and it was just barely a ground covering. So regardless of the great forecasting by my favorite weather people, I was unprepared in the outdoor clothing area. Luckily on Saturday, with the high winds and drifting snows, we stayed inside in PJs and cozy lounge-wear. But on Sunday, we had to get out for the Big Dig. The basics for a big snow, must include a pair of tall boots. I wore my quilted Eddie Bower ones on Saturday, and while they are very warm, they were a little short for our two feet of snow. 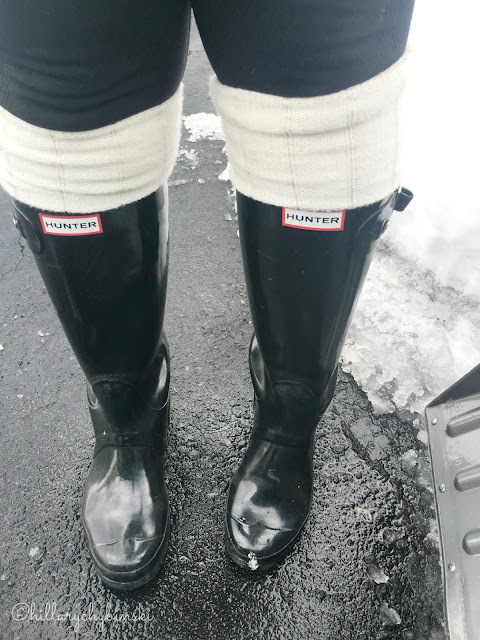 On Monday, I switched over to my favorite Hunter Wellies with a pair of boot socks. That's the perfect combination of warmth and dryness. Gloves completed my outfit. and I was ready for shoveling. I have small hands, and struggle with gloves that fit. I used an old pair of fleece gloves from Lands End that I've had for years. Their outdoor clothing is great, and I have always relied on them for hats, gloves, snowpants and jackets for the kids, and outdoor staples for myself and my husband as well. Is it snowy where you live? What are you wearing? This post is linked up at The Pleated Poppy - be sure to check it out for even more outfit ideas and inspiration.